Gummi USA Clutches Brakes « Revro – New & Used Industrial Equipment, Service and Spare Parts. GUMMI® is a leading designer, marketer, and manufacturer of power transmission components for industry worldwide. It manufactures a variety of different style couplings, a broad line of pneumatic (air) clutches / brakes, various types of friction materials. 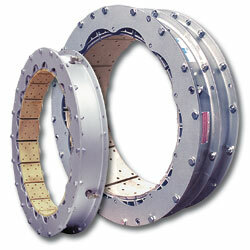 Considered to be the workhorse or drum clutches, the Gummi type FKT element was designed principally for high torque / high thermal capacity applications on heavy duty equipment. The FKT element offers the versatility of the type FK, while also providing enhanced heat dissipation due to its highly ventilated construction, which allows for the passage of cooling air. In addition, every single component of the type FKT element is replaceable meaning the clutch can be totally rebuilt. The type FKT elements are available in 30 sizes, in single, dual, wide, dual-wide, and split configurations.